A badge of honour to show that your outlet serves great quality cask ale. How is the quality measured? Scores out of 5 for temperature, appearance, aroma and taste on each beer. You need an average of 16-20 across beers to pass. Consistently serve all your cask ales according to best practice, and your pub will definitely qualify! An inspector calls! You provide free samples of up to 6 cask ales. Each one is tested according to temperature, appearance, aroma and taste. ‘Scores on the Cellar Doors’ are audited for new applicants. (www.sotcd.co.uk). Highly qualified, hugely experienced experts from the brewing industry. They introduce themselves – and carry photo ID. Serve all your cask ales in perfect condition! Unless they are marketed as cloudy, unpasteurised or un-fined, they should be bright and clear. There shouldn’t be any ‘off’ aromas or flavours. There should be a tingle-on-the-tongue from the naturally-produced carbon dioxide. They should be served at 11 – 13oC. If any are over 15oC, you will fail. What do we get for passing? 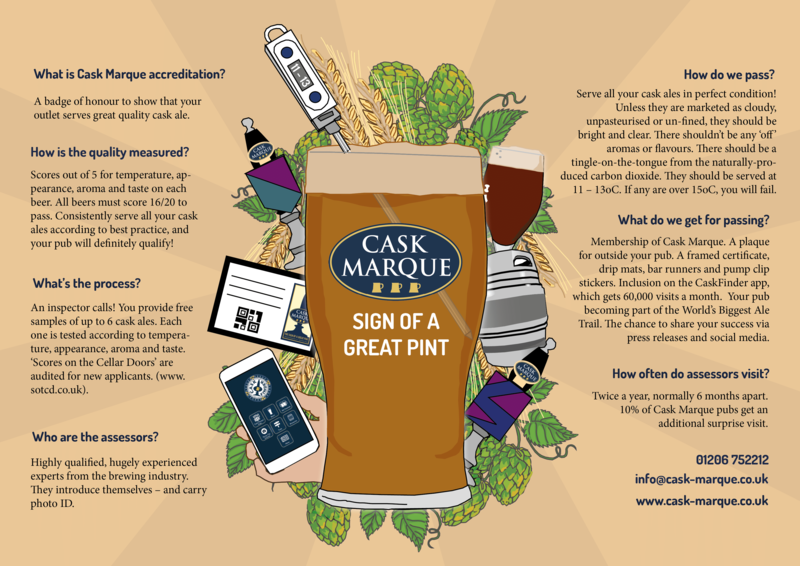 Membership of Cask Marque. A plaque for outside your pub. A framed certificate, drip mats, bar runners and pump clip stickers. Inclusion on the CaskFinder app, which gets 60,000 visits a month. Your pub becoming part of the World’s Biggest Ale Trail. The chance to share your success via press releases and social media. How often do assessors visit? Twice a year, normally 6 months apart. 10% of Cask Marque pubs get an additional surprise visit.